Lesson 1, "King Tomato": we prepare all sorts of dishes with tomato, the real King of the Italian cuisine. Among others oven-baked aubergines with cheese and tomato, Roman stuffed tomatoes in the oven, herb frittata strips in tomato sauce, fried panzerotti with tomato and mozzarella from Puglia plus a beautiful dessert. Lesson 2, Beautiful Winter dishes: among which a 4 cheeses terrine with nuts and pears served with home-made nut and figs bread, a creamy mushroom paté, small spinach gnocchi with a creamy sauce, chickpea-vegetables burgers with a spicy home-made salsa, aubergine "schnitzels", a hearty winter salad with lots of green veggies and the "roses cake" from Mantua with sabayon. Lesson 3, A stroll through the Italian regions: with among other a wonderful focaccia with tomato and olives from Bari (Puglia), Sicilian arancini di riso with sun-dried tomatoes, minestrone alla genovese, spinach gnocchi with a creamy sauce, ricotta fritters from Calabria and salame di cioccolata, a wonderful, chocolaty "salami" made with cocoa, almonds, butter and dates. Lesson 4, Easy and laborious at the same time: with among others a zucchini spaghetti ("courgetti") with herb pesto, creamy Italian mushroom soup, oven-baked mozzarella "cocottes" with tomato sauce, a rich frittata with spaghetti, little courgette "towers" with a delicate cream made with peas, pizza with pecorino, vegetables and fresh tarragon plus a wonderful tart with lemon custard and limoncello flambéed apples. All cooking lessons start at 18.30 hrs and end around 22.30 hrs. The price for this course is € 295,00 including Prosecco, wine, all other drinks and all recipes (excl. VAT for companies). You can also give this combination of 4 lessons as a present: buy a gift voucher for a 4-week course! Groups: We work in groups with a minimum of 6 and a maximum of 14 participants. In case you have to miss a lesson it’s possible to send a friend, colleague, family member and so forth in your place. Would you please communicate that to La Cucina del Sole before the lesson starts? Grazie! Special requirements: are you allergic for certain ingredients? Please tell that to Nicoletta so that she can make sure the menu fits your requirements! To book a course please send an email clicking on this link. 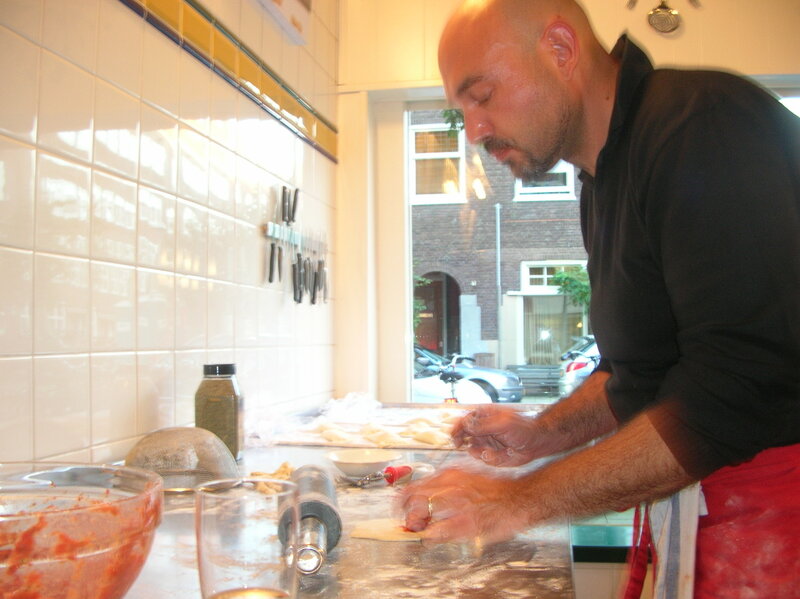 Here at Italian cooking school La Cucina del Sole in Amsterdam you can book a morning, afternoon or evening cookery session with your own group (lunch or dinner). Our cooking workshops are totally suitable for corporate events, team building, bachelor parties, staff meetings with an extra activity and family reunions. How does it work? You choose a date according to your availability and that of the other participants, you book and you cook all together, after which you enjoy a wonderful, real Italian meal prepared with the best ingredients. These cooking classes are ideally suited to serve as a company outing or team building activity. Everyone gets to know each other better while preparing a wonderful traditional Italian meal and enjoying together all the different dishes while drinking fine Italian wines. You can also decide to have a meeting first (with coffee/tea, fruit, drinks and snacks) and then a cooking session. Our cooking school is perfectly suitable for both activities. Each workshop includes Italian snacks while cooking, ingredients, e-recipes to use at home too, 1 glass of Prosecco with nibbles on arrival, three glasses of wine or six glasses of alcohol-free "wine" (Amé), Italian beer, Italian mineral water, juices, coffee and tea. The prices: € 75,00 p.p. (lunch) and € 89,00 p.p. (dinner) ex. VAT for companies. For more info please look at the website or send us an e-mail. 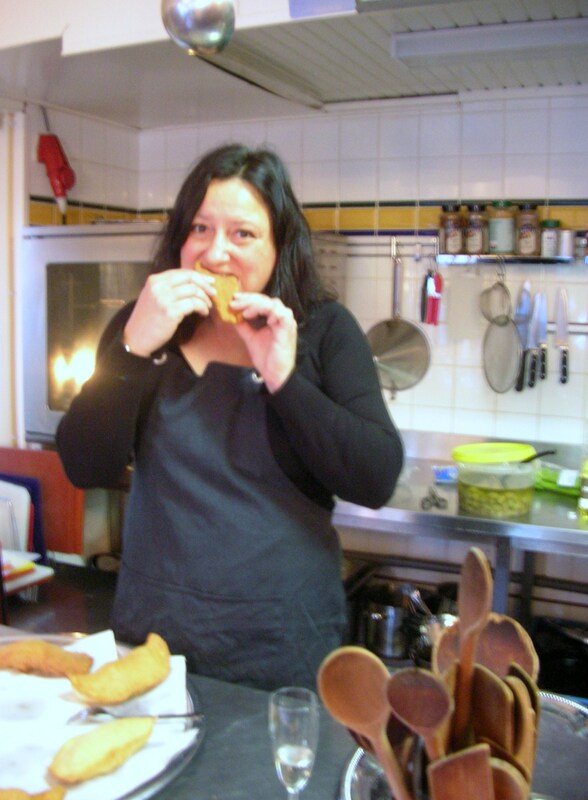 La Cucina del Sole was founded in 2002 by Nicoletta Tavella, a cook and cooking teacher born and raised in Italy. Nicoletta is also a certified Sommelier and a cookbook writer. Panzerotti baresi (a typical dish from Bari) are a great pleasure to eat. When they’re hot, just out of the frying pan, they’re lightly crunchy (the fried golden dough on the outside) and moist and savoury inside (the tomato-mozzarella filling). You’ll have to pay attention to the volcanic temperatures of the filling when you bite into them, though! The ingredients are quite easy to find and you won't regret the little bit of effort they require. 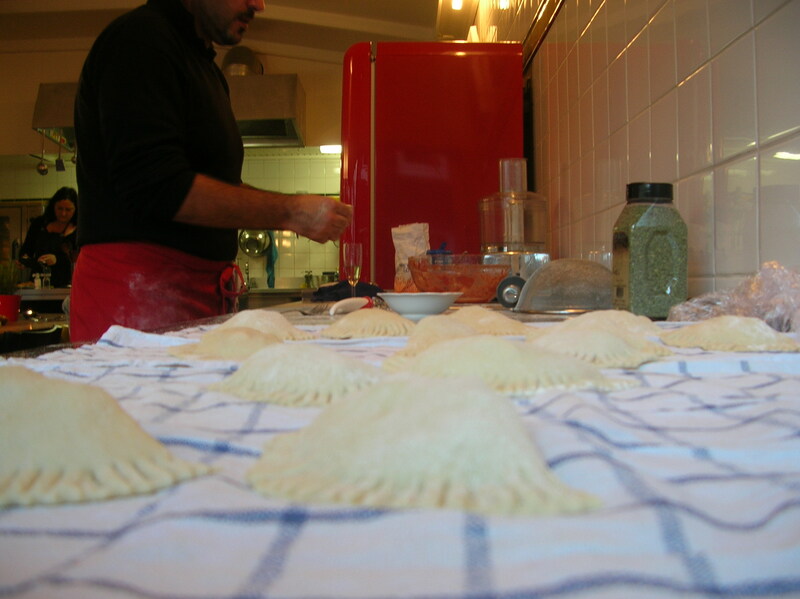 It had been months that my friend Claudio Varone and I where planning to make panzerotti. Claudio is an architect, an artist and a wonderful non-professional cook and he’s always ready to experiment in the kitchen with me. Frying is not my favourite thing to do – I can’t stand the smell! – but in my professional kitchen it’s a piece of cake thanks to the huge extractor hood that removes all the not so pleasant smells. So at last we decided it was time to prepare our very first panzerotti. The experiment was definitely a success, we were really happy of the end result and so where the friends that shared the panzerotti with us. Making panzerotti is not that difficult, you need a bit of patience and a few - practice makes perfect! - manual skills. This video recipe is a good visual help that complements the written recipe. Mound the flour on the table and slowly add olive oil and mineral water mixed with milk. Dissolve the yeast in 3 tablespoons of water and add it to the flour too. Kneed until you obtain a relatively soft dough and then add the salt dissolved in a bit of water. Kneed further until the dough becomes soft and elastic. Make a dough ball, grease it well with olive oil to avoid drying and leave it to rest in a bowl covered with plastic foil after cutting a cross on it to ease the rising phase. In the meantime you can strain the peeled tomatoes and the diced mozzarellas to eliminate the excess liquids. 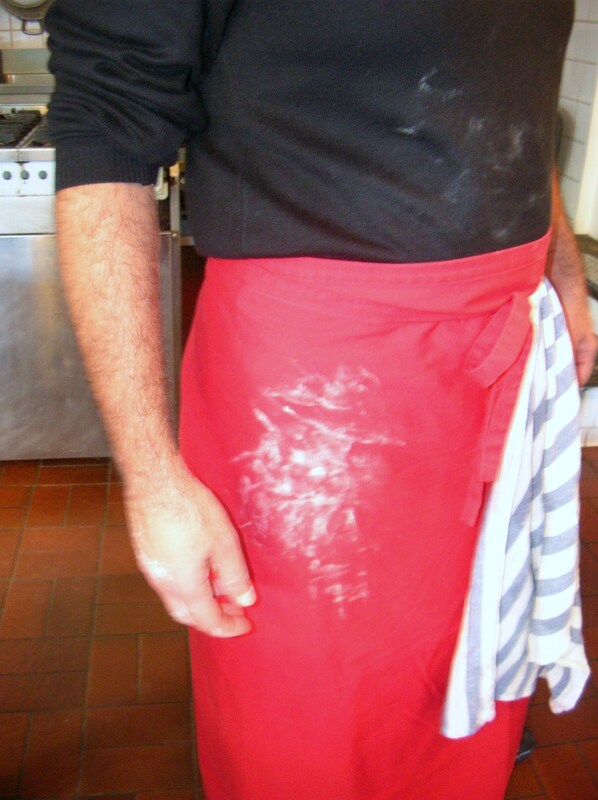 Dust the table with flour and cut the dough in chunks. Make little dough balls and leave to rest on a kitchen cloth, covered with another kitchen cloth. Mix peeled tomatoes and mozzarella chunks and season with salt, pepper and oregano. Flatten the dough balls giving them a rounded shape and fill with some mozzarella-tomato mixture. Seal each panzerotto well pressing the rim with your fingers and remove the excess dough with a pastry wheel. Seal further using a fork and fry in abundant hot (180°C) sunflower oil, draining on kitchen paper once they’re golden brown. During the whole month of June at café Metro St. James inside Hyde Park in Sidney you can pay your cup of coffee with a kiss. What a nice idea! A classic traditional Spanish dish, paella is originally from Valencia, a city on the East coast of the country. The original version called paella valenciana involves the use of flat green beans, meat (mainly chicken and rabbit), white beans and snails, but there are many variations that include only fish, crustaceans and molluscs (paella marinera) or meat and fish together (paella mixta). 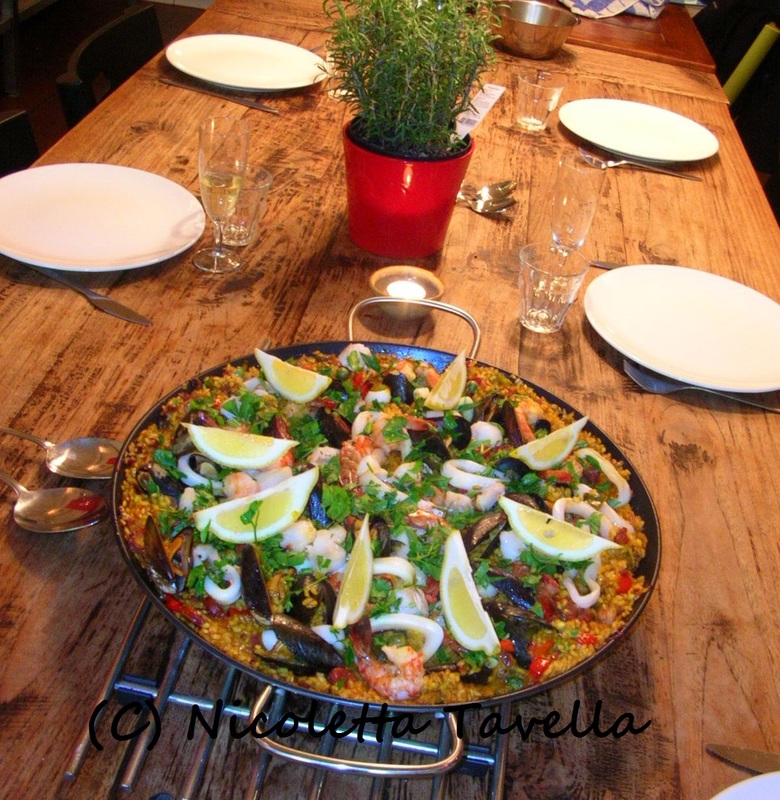 The wide, shallow pan used to prepare this recipe is the paella, also called paellera. Spaniards are quite divided about the right name for this beautiful cooking instrument: some prefer paella and some others argue that the correct name is paellera. The Real Academia Española, the official institution that takes care of setting the rules for the Spanish language, accepts both. For clarity in the recipe we use the term paella for the dish and paellera for the pan. When looking for one to buy, select it possibly with a thick enough bottom to promote uniform cooking of the rice without burning it. This has to happen in such an way that the rice is no longer stirred after a first, initial stir so as to form that delicious crust on the bottom of the pan that, together with the perfect cooking of all the ingredients, characterizes a really well done paella. This version by Oliver, a friend from the Spanish Canary Islands, is a paella mixta, with meat and fish together. The chorizo ​​used here is the classic Spanish pork sausage characterized by a uniform red colour even in the fat parts since the meat and fat mixture has been flavoured and “coloured” with pimentón, red smoked pepper powder, or more or less spicy paprika. The use of fish, crustaceans and molluscs makes the preparation a little more delicate than a paella with just meat as it is necessary to avoid overcooking the prawns that would otherwise become unpleasantly flaky. Add them when the rice is almost cooked calculating about three more minutes on the stove. Also for cod and squid it is preferable to avoid too long a cooking time (4 to 5 minutes maximum). Oliver cooks the mussels long enough to ensure that the rice absorbs their juices and flavour even better. The video has Italian subtitles only but you’ll get what we mean by looking at the images and following the written recipe you find here. Heat plenty of oil in the paellera and fry the chopped onions in it. Add the diced peppers and the finely chopped garlic and fry for a few more minutes. Add the chorizo, the bacon or pancetta and the blanched, peeled and diced tomatoes together with the Cayenne pepper. Stir and cook for about 5-10 minutes on a medium heat. Add the rice, raise the heat a little and stir well. Pour the white wine, stir and allow the alcohol to evaporate. Season with saffron, stirring well to give the rice a beautiful, uniform yellow colour. Place the mussels on top of the rice and stir gently. Add the peas and, immediately after, 4-5 ladles of hot stock which will have to cover the rice completely. Cook the rice on a medium / high flame until almost cooked, adding stock from time to time if it gets too dry. Add the squid cut into rings and the fish fillet into large pieces and push them gently into the rice without moving it too much. Add more stock if necessary. Add the prawns to the paella about three minutes before the rice is ready. Lay them on the rice and turn them so that they evenly cook on both sides. If you don’t want to risk overcooking you can also briefly sauté them in a pan with a little olive oil and then add them to the paella once you take it from the fire. Season with a little salt if necessary. Turn off the heat and let the paella rest for 5 minutes. Serve garnished with chopped parsley and lemon slices. 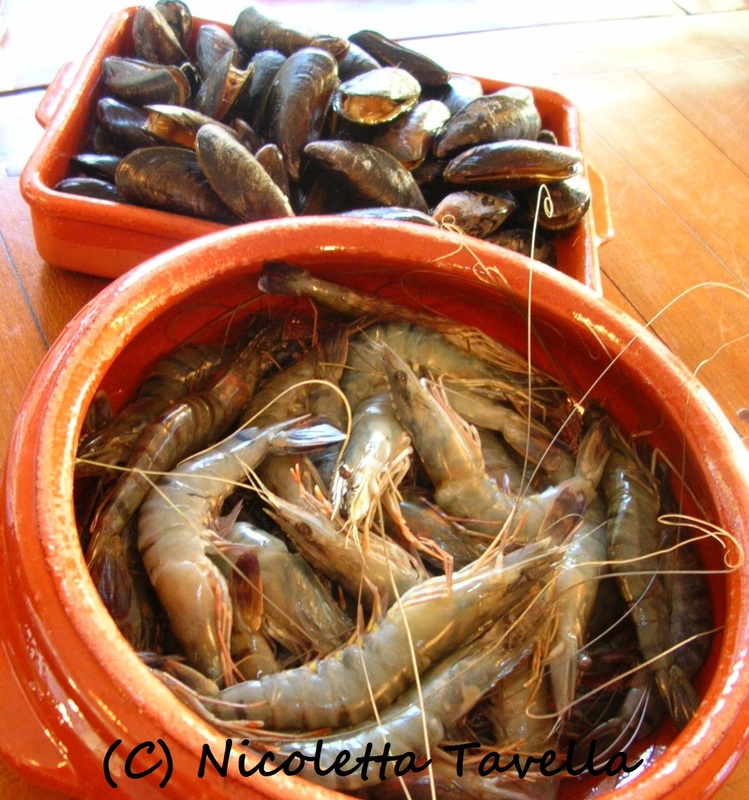 La paella di Oliver from Nicoletta Tavella on Vimeo. This is a very simple recipe I made with my experiments-in-the-kitchen partner Claudio Varone, a dear friend and a wonderful interior designer and artist, when we were spending a weekend together with some friends in a lovely house on the Dutch countryside. It's his hands you see in the picture - I'm not THAT hairy ;) - and we prepared this dish in no time. I'm going to make this on Easter Monday because I've decided to have a totally meat-free Easter. I'm eating a lot less meat in general since quite some time, and I try and buy only organic when I do. Moreover I have regular fish cravings and a nice piece of wild salmon is really perfect to satisfy them. You'll only need a big piece of GOOD salmon (we chose the wild Alaskan one) and a few more ingredients among which some fresh herbs of your choice. We used chives and oregano and since the lattest was flowering we added some of the flowers too for extra taste and texture (and beauty!). You can serve this wonderfully aromatic salmon like we did, with boiled organic potatoes simply dressed with extra virgin olive oil and salt, and a colourful mixed salad. Roasted potatoes with rosemary and garlic will be perfect too. Preheat the oven at 180*C.
Mix lemon juice, mustard, honey, a bit of salt and pepper and three tablespoons of olive oil together making a nice, smooth emulsion. Lay the salmon on a sheet of baking parchment big enough to easily wrap it all and "massage" it with the emulsion. Spread the herbs on top of the salmon and wrap it well in the parchment. Bake in the oven for about 20-25 minutes and serve immediately. From the 21st to the 25th of February I was in Paris. Not for a long weekend in the Ville Lumière, purely for relaxation and some good old compulsive shopping, but for a visit to the Paris Cookbook Fair. There was I, under the Pyramid of the Louvre, with a stand in the name of Choizes (my Dutch publisher) and my cookbook. Exciting! And fun! So many famous chefs (including the fantastic Annabel Langbein), writers, food bloggers, food photographers, foodies and cookbook publishers under one roof, something which I had never experienced before! And Paris! It's not my favourite city in the world (that very special place is, of course, reserved for Amsterdam!) but in a weird way I feel very much at home there and I enjoy the atmosphere, the food and the beauty. Could it be it's because I speak the language quite well? Or perhaps because - I clearly believe in reincarnation - I lived there in a previous life? Who knows. It's a funny feeling. I quite dislike certain things in Paris - the arrogance in some shops and restaurants, a tad too much grandeur everywhere, and too many useless macarons :D - and yet I feel completely at ease there. There it is, a bit far and not really sharp because of my shaking hands plus with the old cover, and yet... my book on the third place! On the big screen! 3rd! What a nice experience that was. Who would have imagined it when I started this book in 2011? My applause goes to my publisher, Choizes, my mother Gabriella Formigoni who worked at the book and cooked with me, photographer Jan Bartelsman, stylist Jan-Willem van Riel, editors Bel & Jet, graphic agency Van Erkelens and all the people who have worked on the book.